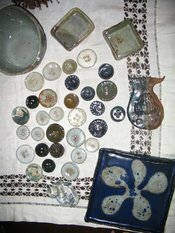 I’m in love–in love with pottery, in particular with making buttons. Last night was my final stoneware class and I was sad to see it end. We had a sort of "pottery party" to close the class–looking at our work, talking about what went well, what didn’t…all while standing around the pottery studio eating hummus, wheat crackers and drinking wine. It was quite the combination. I was glad to get some time with my instructor at the end of the evening after everyone had left to ask him my little list of questions. We talked mostly about ‘where to go from here.’ I’ll be taking another class after Christmas and he said he’ll comp me some clay and glaze. I’m anxious to have some more time for trial and error, because just looking at the things I made, I can tell I have a lot to learn, to try. So for now, I’m happy to look at my buttons, put them on a few sweaters I’m knitting, maybe as a little detail on a hat, maybe see if they’ll sell on etsy (to support a bit of my next class tuition), put a few of the little dishes around my house (emma has already claimed one for her barrettes), and wait for a new class with new opportunities. Those buttons are awesome, John has been wanting to take a pottery class forever, Did you go through a communty college, or somewhere else, I want to make buttons, those are adorable. I am in love with your buttons too! Great to see you work. We’ll be watching to see an update on your Christmas class. Next: lampwork! A natural for a knitter: colour and buttons to boot. 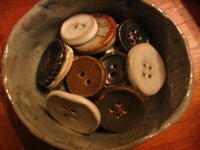 I had no idea that you could make buttons from clay! They came out great! I can’t wait till my kids get old enough that I can get out of the house, and take classes like this. LOVE the buttons! i might be getting pottery classes for my xmas present from my husband. nice chance to get away and be creative! those buttons will look beautiful on some of your knitted creations. soooo great! The colors are awesome and i love that they have a “folk” sense about them. Seriously-when you sell them-please email me-i really want to buy some!